Teaching always reminds me why I love telling stories. 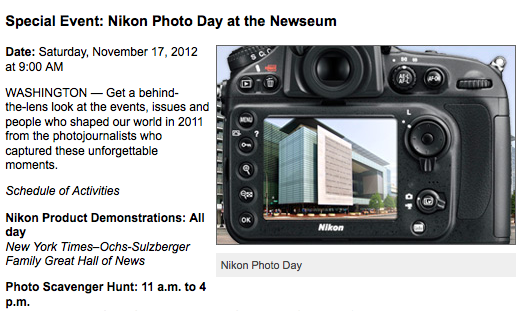 This Saturday November 17 I’ll be lecturing about visual storytelling at The Newseum. My lecture will last 45 minutes but the event lasts all day and includes multiple lectures, a photo scavenger hunt, a hands-on demo of all of Nikon’s latest gear, and more. More information about the photo day schedule here. You will have access to the whole museum. Go check out White House News Photographers Association’s Eyes of History exhibit. Some of my work is on display there and it includes a video interview with me for my “video editor of the year” award. I’ve been so busy I haven’t even had time to see the exhibit. This will change on Saturday. Below is a teaser of the video on display.